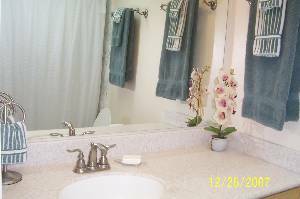 Oahu/Beachfront = The Hawaiian Princess Unit #305 Book Online Now! 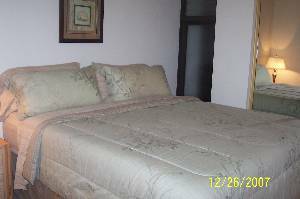 Located on the 3rd floor, this unit is clean, tropical and has all the comforts of home. NO Smoking allowed on the lanai. The Hawaiian Princess is nestled on a secluded, pristine cove on the West Coast of Oahu. You will enjoy an unobstructed ocean view from the back of your unit, and the front of the building faces the magestic Makaha Mountain Range. Our cove is home to sea turtles and many colorful tropical fish. Some of the best snorkeling on the Island is steps away from your unit. If a swell comes in, boogie boarders and surfers enjoy the waves. During whale season, you can watch whales playing right from your private lanai. Spinner Dolphins frolic in front of the building year round. The dolphin tour boats often stop in front of the Princess to watch them. You'll have the option of lounging by the pool, taking a dip, or relaxing in the jacuzzi. If you prefer the ocean, it's a few steps away. Snorkel, boogie board, surf or just bob in the clear clean warm salt water. Sunsets on the West Coast of Oahu are the most amazing on the island. Every night is different, and once again, you will have a front row seat right from your condo's living room and lanai. If there's a full moon during your visit, you will be able to enjoy the large silver path on the ocean in front of you. 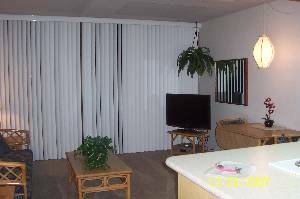 Sit on the beach at night and star gaze, then return to your comfortable, well appointed condo and fall asleep to the sound of the surf. 2nd TV in the bedroom. This is the view looking to the right from the private lanai. 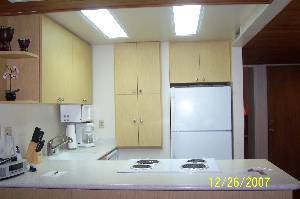 Enjoy sunsets, starlight and romantic dinners without ever leaving your unit. Comfy queen size sleeper sofa in a tropical design adds to the Island flavor of this unit. Our pool is equipped with state of the art salt filtration system, and is a great way to cool off and meet people from around the world. Fully equipped kitchen with an ocean view. Living Area with flat screen tv, ocean views and breezes. Other Fees: For lost or stolen key sets there is a $70 replacement charge.